What would be a good 22 cal Bullseye pistol in the under $500 range. I currently am shooting the Ruger MKIII and S&W 22A, both of which are OK guns. I'm looking for something new to play with. Buckmark or S&W Victory and if you have a 1911 then try the Nelson. You have about the best in that price range, you could move up to a conversion mounted on a 1911 frame, nelson or marvel go for a liitle under 500.00 but you need a 1911 frame, or a walther/ham xesse is a good one but runs about 1000.00 a great alternative is a sig/hammerli trailside they don't make new ones any more as walther now justs markets the xesse but you can find them on gunbroker all the time for around 600.00 just be sure to get the 6''. If you choose the Browning then go for a model (like the hunter) that has the older style of grips. There are a lot of target grip options available for them and only one (3 d) that I know of for the others. I looked at the Marvel .22 conversions at Perry this year. They had one that had a full length rail across the top with iron sights in the rail. Very nice and clean. 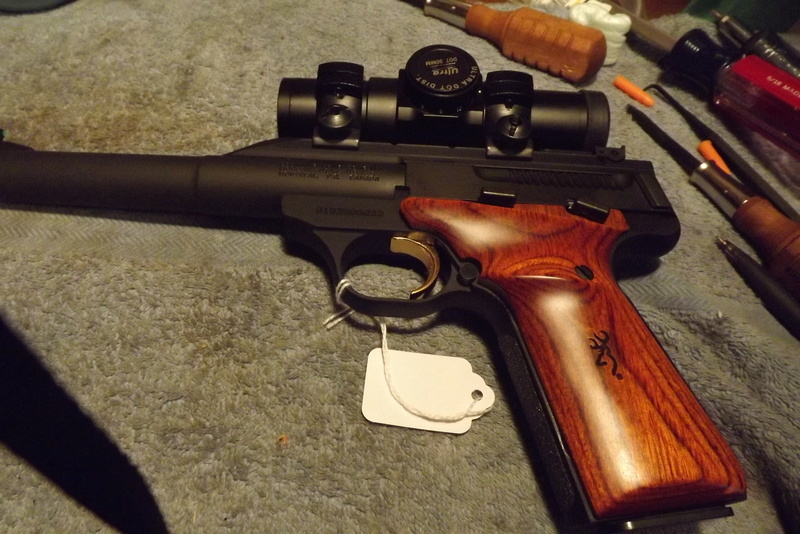 patnemes wrote: What would be a good 22 cal Bullseye pistol in the under $500 range. I currently am shooting the Ruger MKIII and S&W 22A, both of which are OK guns. I'm looking for something new to play with. Ruger should be plenty good. I would stick with that until you are making good scores. If you could score an Old Browning with a 7 inch barrel and adjustable sear for under $300 try to score that , I borrowed one for EIC and shot 272 NMC with it and I shot a 78 SF. The Victories look ok but the triggers are a little stiff. I like my Nelson's so much so, I made two dedicated lowers. Are you referring to the Challengers with 6 3/4" barrels? They haven't been that inexpensive in a looooonnnnngggg time. The older field and target models of the buckmark have a good built in Weaver rail and a bull barrel. Do you have a Volquartzen trigger in the Ruger? That would be a great move if not. A High Standard M107 would be nice. I just picked one up and I love it. OP, get a Volquartsen LLV. It's an upper that will fit onto your Ruger MKIII lower. Then see if you can get an upgraded Volquartsen trigger pack and you'll be shooting nothing but tens in no time. I don't know where you're located but if you're in Nebraska, Deguns sells them. Additionally, they're available on the web and I would recommend the six inch version. ETA: It's not set up this way and I never used it with the Aimpoint, but some of best scores were done with this and that mediocre 22/45 trigger. I bet you could get a "shooter" grade High Standard for at or near that price. I have seen them for sale around our indoor league. The trigger alone would be reason to look for one over a Buckmark or Victory. Thanks for all the responses to my question. 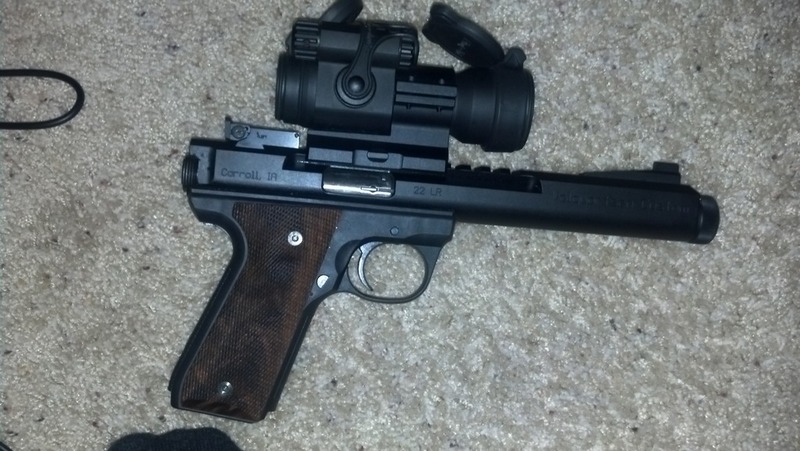 I do want to shoot with an optical sight. My old eyes find iron sights a bit hard to use even with corrective lens and an aperture attached. When I started Bullseye in the early 70s the choices were much more limited and just about everything was under $500 even Clark custom 45s. And hardly anyone used an optical sight. The fact we can still buy good target 22s under the $500 mark is a tribute to modern CNC machining and darn good manufacturing engineers. I am leaning toward the Browning Buckmark Contour which retails here for $450 but that could change as I read all the responses on this forum to my question and questions from others.